An island can be a secluded place of refuge. For those who spend their lives there, islands can also turn claustrophobic and isolating. Both hold true in Catherine Banner’s marvelous debut novel, a near-century-spanning epic set on the fictional isle of Castellamare, a five-mile-wide heap of rock off the Sicilian coast – a place with a founding myth of its own, and where the gossip flows like the limoncello at the Espositos’ bar, the evocatively named House at the Edge of Night. Amid this picturesque Mediterranean milieu, its residents interact with one another, the world outside, and the cultural heritage that surrounds them. The focus falls on four generations of Espositos, and their stories unfold in the lively style of a folk tale but with the realism of a meaty historical saga. The combination makes for reading enchantment. It begins as the future patriarch, Amedeo, arrives at Castellamare in 1914 to become the island’s first-ever doctor. Scandal arises when his intelligent dark-haired wife, former schoolteacher Pina, and Carmela, estranged spouse of the wealthy conte, give birth to boys on the same night – half-brothers, perhaps. Many well-defined characters play roles, including Maria-Grazia, a fragile child who becomes a determined woman; Robert, the Englishman from the sea; fishermen, poets, and entrepreneurs; even Gesuina, the near-blind midwife whose passing marks an era’s finale. Both world wars transform the island’s inhabitants, as does the 2008 financial crisis. Rivalries develop; secrets are revealed; tender love affairs form; relatives are lost and found. There are a treasure trove of stories and many fabulous turns of phrase (“a face like bad weather”). The novel dares to take its time, to remarkable effect. Incidents gain near-mythic status as the decades pass, and the large scope lets readers see the original events and, much later, the legends they create. In Banner’s gifted hands, both are equally absorbing, and equally magical. 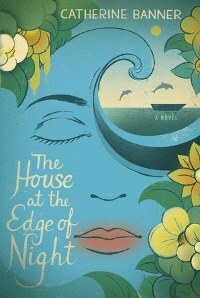 The House at the Edge of Night was published by Random House in July ($27 hb/$13.99 ebook, 432pp). The UK publisher is Hutchinson. 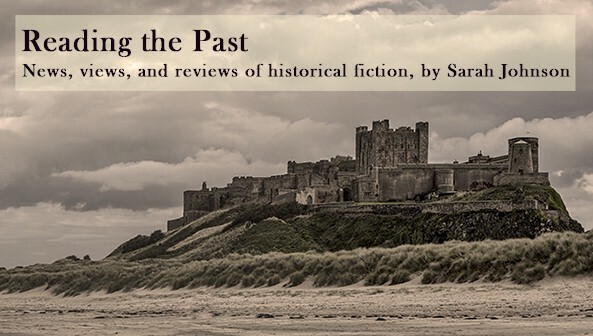 This review ran in August's Historical Novels Review. The book is a great summer read, and I love the cover. 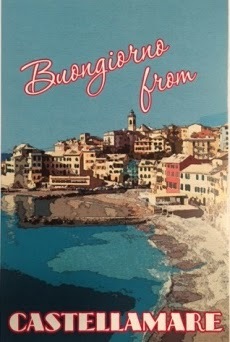 And here's the postcard the publicist sent along with the book. Very clever. I hadn't heard of this one, but it sounds quite interesting! I enjoy well-written generational stories with a lot of content, and it sounds quite captivating. I'll have to check it out - great review! Thanks, Jordan! It kept me entertained for days.